Adelaide is the capital of South Australia and although it is its largest city, it has a compact core and many distinct neighborhoods defining it. 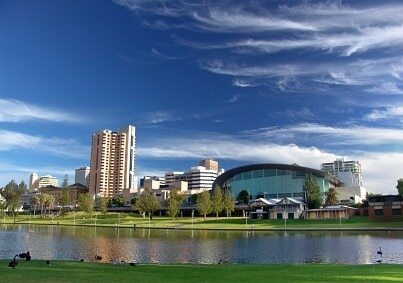 Adelaide is a place of interesting old buildings that blend with modern arcades and large parks and gardens. It is the main launch point for visiting the wineries of the region and has many beaches. Whether your tastes run to subtle, sophisticated cocktail bars serving up classic concoctions, or prefer to hit the dance floor in neon-lit mega-clubs, there's nightlife to suit everyone in the South Australian capital of Adelaide. From vast theatres putting on blockbuster musicals to cavernous museums that delve into Aboriginal art, Adelaide has no shortage of distractions. With ornate churches and grand 19th century architecture sitting alongside the sleekly modern landmarks, urban sightseers will have plenty to feast on too. Adelaide is good for anything, from the best white opals and other gems to crafts, wines, clothes and antiques. The city is loaded with markets, including that of the bustling Central Market where you have all sorts of foodstuffs, while fashion boutiques and large department stores also abound. Adelaide boasts hundreds of restaurants, most of which are in the easy-to-navigate downtown area where there is a profusion of traffic-free streets. The good thing is that many cuisines are represented, from good old Aussie tucker, to superb Chinese, Thai, Japanese, Greek and Italian fare. Adelaide is loaded with historic highlights: churches, museums, galleries and manor houses. Also comes with beautiful parks and gardens. Its collection of attractions will appeal mostly to the discerning traveler looking for history as well as fun in shops and bars. With its low rate of crime, Adelaide is one of the safest large cities in Australia and the public transport infrastructure and hospitality are excellent. It is worth keeping an eye out for Hindley Street at night and also taking into account that the weather is changeable at various times of the year. Laid back, sun-dappled and dotted with eye-catching attractions, Adelaide is a somewhat underrated Australian city compared to the more obvious hotspots of Sydney and Melbourne. Visit at the right time and you'll fall in love with the relaxed South Australian capital, its maritime vibe, and its surrounding beaches.